Which mold for .357 mag handgun? 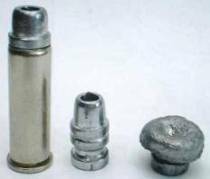 Thread: Which mold for .357 mag handgun? I currently have a Ruger Blackhawk but am about to get a S&W 686 and load both with cast loads. Which mold do you have? Why did you choose it over another? Do either of my .357 mag handguns lean better toward a certain design? For economy you can't beat the Lee 358-158-RF. It comes in 2 and 6 cavity. To satisfy the lore of the almighty gods of casting you'll have to overspend and get a Lyman 358156 (it requires a gas check) but this is a good design and very versatile. C. Lee Nickel, ironhead7544 and 1956CJ5 like this. Can't go wrong with a semi-wadcutter, either. I don't own a .357, but in my .44 mag Ruger Vaquero and .44 mag Winchester 94 I've used a steady diet of my cast Lee semi-wadcutters for about 20 years now in both .44 magnum and .44 special cases. I don't resize, and I "tumble lube" them in a plastic one gallon ice cream bucket with Lee Liquid Alox. Good accuracy over thousands of rounds and nearly zero leading, even with hot loads. I wouldn't hesitate to go after deer with that bullet, either. Last edited by C. Lee Nickel; 06-24-2017 at 06:17 AM. GasGuzzler and gunscrewguy like this. I don't own a 357 mag pistol, but I do have a marlin 1894c 357 mag, and have tried several molds all which have dropped boolits that shot well thru he rifle. I have, and use Lyman 358156 155gr semi wadcutter , 358311160gr round nose, lee 358-125-rf... The lee 125gr boolit so far has been the little bullet that could, shoots as good as any of the others, saves a little lead, and holds together outstanding and currently is my favorite boolit. I would suggest if you can try some boolits before buying a expensive mold to see if they will shoot well in you gun, I find it much easier to cast from the iron molds and prefer RCBS to the others I have tried so far... but for the price it's hard to overlook the lee molds for price. edit to add this.. Have you slugged the bores of your pistols yet to determine the needed bullet diameter.. ? Last edited by rclint; 06-24-2017 at 06:24 AM. gunscrewguy and Ret_Eng like this. I have more guns and molds for 357 than any other caliber but my everyday go-to mold is the plain base Lee 6 cavity TL358-158-SWC. This is an inexpensive mold that can crank out a pile of bullets in no time and works just as good as any of the fancy boutique molds I own. rclint, gunscrewguy, GasGuzzler and 1 others like this. Western Tennessee, close to the Big Muddy - but not TOO close! My 1st .357 mag revolver was a Colt Trooper (after hitch w/Uncle Sam and back in college). I tried a coupe different Lee molds, but had leading and accuracy issues and I just never could get used to aluminum molds (Your results may vary!). On Skeeter's recommendation I purchased the Lyman mold 358156 in a double cavity. No more leading or accuracy issues. That bullet, sized .358" has done well in my Trooper and several S&W's. It's taken bullfrogs, feral cats and other varmints, and even a couple of whitetails with nary a hic-cup. That was over 40 years ago and the "original" mold is still running strong. I've added an HP version and a four cavity as well. The ONLY .357 mag firearm that didn't do well with this bullet is my cantankerous Marlin 1894 Cowboy (SHE only likes heavy for caliber cast bullets!). gunscrewguy and .DIRTY-.THIRTY like this. I like Elmer Keith's old bullet, the Lyman 358429. It will work fine in the Blackhawk and the L-frame Smith. It is too long to work when seated to the crimp groove in a N-frame S&W; '94 Marlin; or '92 Winchester or clone in a .357 case. Zingger, white cloud, Travlin and 1 others like this. I like Elmer's boolit so much, I had a custom punch made for my Ideal FBI mold. Travlin, 1956CJ5, ironhead7544 and 4 others like this. Most of that bullet's added weight is below the crimp groove. Not sure about others but my SRC92 has no trouble cycling those.....it'll eat my 180s at 1.63". I have two four cavity Lymans that I use for various purposes. 357446, a plain base with three grooves swc is my go-to for plinking and small game. 358156 gas check swc is my .357 90% load bullet for my 92 Win, my 686, my stainless Blackhawk when I want to go over 1000 fps. I also have a two cavity 160 grain full wadcutter mould that is crazy accurate with any load in any of my guns up to about 900 fps. 358432, I believe. I have the Keith four cavity that was in my brother's estate but have not tried it yet. Lyman #358429 170gr for 357 mag Marlin 1894?